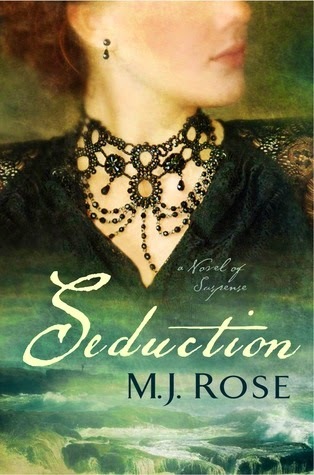 Seduction by M.J. Rose is a hard book to review. There is a lot going on in this book—different story lines that cross, characters that have past and future lives, and many different locations. At times, I was a bit bewildered with how the storylines fit together. Add to that an over-the-top focus on séances, mysticism, and Druid ruins and what you have is sort of a mess. One story line is about Victor Hugo (yes, THAT Victor Hugo). While he has experienced material success from the publishing of his novels, he is despondent over the death of his daughter. Leopoldine, who is presumed dead in a yachting accident, was the light of Hugo’s life. In his overwhelming grief, he decides to try to contact her through the use of a Ouija board. When she appears, he is overjoyed, but he is unaware of the consequences of opening a door to the spirit world. A modern story line is about Jac L’Etoile. She is invited to go to the island of Jersey to investigate Celtic ruins. She is reunited with Theodore Gaspard, who was a fellow patient with her at a mental hospital. The two of them were romantically involved at that hospital until Theodore’s unexpected departure. While they look for the ruins, they are also faced with the intricacies of Theodore’s family: his brother and his two aunts who add to the family intrigue. Finally, Jac is haunted by flashbacks to a life that she never lived—during the Celtic days. She sees life through another’s eyes and she has to figure out how this information figures into her present circumstances. If this sounds like three different storylines that may not come together well, you feel the way I do. Add to all of this a series of child abductions, an appearance by Satan himself offering a Faustian bargain, and a suicidal mistress, and you have the outline of Seduction. This book was just a jumble of storylines, plots, mystical mumbo jumbo, and a bit of historical fact. It was a tedious and confusing read. While the storylines do eventually overlap and make sense, it is a long time getting there. Unless gothic mysticism is your cup of tea, I would skip Seduction.